garden 4 - is it omen? A sign of things to come in restored garden? This tree, seen in the Nantwich Walled Garden in Byron Walk, Nantwich, was an unusual sight as it was surrounded by what is otherwise a "jungle". But, could this - or one like it - be seen in the walled garden once it is restored? I SPOTTED this tree just inside the small entrance in the east wall of the Nantwich Walled Garden (no trespassing was needed) and wondered if it could be a omen about how the Elizabethan garden will look when it is restored. I hadn't seen it there previously - just the "jungle" of overgrown plants. It did strike me as a little odd that the tree appeared to be in a clear space in the jungle rather than it being part of that jungle. Did it just grow there? Did it self-seed? Whatever happened it is certainly better than the jungle that is there at present. See this page. I asked Nantwich landscape gardener and plants expert Alderman Doug Butterill what it was and he told me it's an Acer Palmatum Atropurpureum. But best of all, when I checked a book based on John Gerard's "Herball", I saw that the Nantwich-born herbalist lists the Acer (the Latin name) or Maple (the English name), as he described it, as one of the plants that were growing in gardens in his days and so possibly that of the Townsend House gardens. 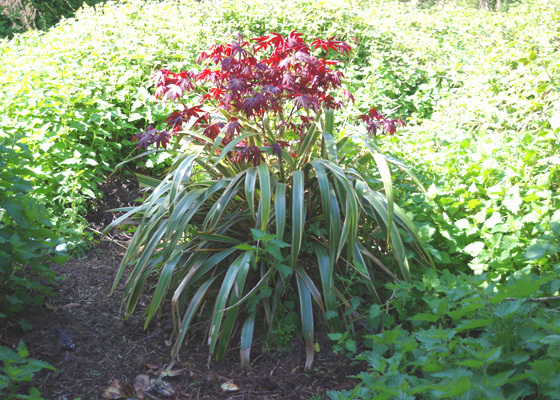 A website search confirmed that the walled garden plant was a Japanese Maple, some of which grow up to eight metres high with a spread of 10 metres. I'm not for one minute suggesting the Nantwich tree is a descendant of a tree that once grew in the Townsend House gardens! But it makes it a good contender for a place in the restored garden. THINGS had changed when I returned to the site at the end of August. There was no sign of the tree. Just the nettles that had spread where it had been seen. But all was not as I had feared. As a deciduous small tree, the Japanese Maple flowers in mid spring and sheds it leaves at the end of the growing season. I realise now that it was there but not as prominent as in the picture. It hadn't been taken into safe keeping until it could be returned to the garden when it is restored. Nor had someone thought it was going begging.